Lowndes County, August 30th, 1836. On the part of the enemy, was two killed in the field that we got, one woman wounded that we captured that died the next day about eleven o’clock. There were signs seen where there were two more dragged into the swamp that we supposed were killed. We succeeded in taking six prisoners with the one that died; the other remaining five, for their better security and safe keeping, I have sent to Thomasville jail, Thomas county, Georgia, where your excellency can make that disposition of them that is thought most requisite. The information obtained from the prisoners, with regard to the number of Indians, was thirty three warriors, thirty-five women and children — sixty-eight in the whole. Our forces consisted of about sixty or sixty-five men; the advance commanded by captain Lindsey, and right flank by captain Levi J. Knight, and left by myself. Colonel Commanding 81st Regiment, G. M.
Near here, on August 27, 1836, Georgia Militia companies commanded by Col. Henry Blair, Captain Lindsay and Capt. Levi J. Knight, fought a skirmish with Creek Indians and routed them, killing two and taking several prisoners. During this summer the Indians had committed many raids and massacres as they traversed the border counties on their way to Florida to join the Seminoles. Georgia troops had been following them for weeks, and overtook this band in the cypress swamp on the edge of Cow Creek. In the summer of 1836 squads of Creek Indians fleeing the prospect of forced relocation to western territories were moving from the Georgia-Alabama line through south Georgia to rendezvous in the Okefenokee Swamp. In their flight, some of these Indians were raiding the homes and livestock of the pioneers of Wiregrass Georgia. Two actions against Indians which occurred in this immediate area included the Skirmish at William Parker’s Place and the Battle of Brushy Creek, which occurred July 12-15th, 1836 in what was then Lowndes County (now Berrien and Cook counties,) Georgia. Captains Levi J. Knight, Hamilton Sharpe, and John Pike led the Lowndes County Militia companies that participated in these engagements. About that same time , Captain Samuel E. Swilley of Lowndes County was in the field in the southeastern part of the county. With a company of about sixteen militia men, Captain Swilley engaged a squad of Indians on the Alapaha River near Troublesome Ford (now known as Statenville, GA), killing ten Indians and taking three prisoners. “About the time the Brushy Creek battle was fought, a squad of about twenty Indians and Negroes came through Lowndes and crossed the Grand Bay near where Fry’s bridge now stands on the Valdosta-Statenville road. Soon after crossing the bay they stole two horses from Jesse Carter better know as “Uncle Tigue” Carter, who lived there on the same land now owned and occupied by George A. and Paul Carter of Echols. This was done in the first part of the night. Uncle Tigue made great haste to Capt. Samuel E. Swilley’s place, who lived at what is now known as the Capt. Bevill old home place. Capt. Swilley started runners in all directions and by 12 o’clock next day he with eighteen men was at the Carter place. They took the trail and about 8 pm overtook them in the bend of the Alapaha River one mile below where Statenville now is, then known as “Troublesome Ford,” making rafts to cross the river. Soon the ro– were seen in a little scrub to the right. “Capt. Swilley ordered the men to dismount and tie their horses. Before the horses were made fast the sharpe rifle and war-whoop were heard all around in the bend of the river. Capt. Swilley ordered the men to get behind the trees which was done in great haste. As soon as the firing ceased Capt. Swilley with his men made a charge on the Indians who were in a halfmoon circle under the banks of the river. The two Negroes made their escape by swimming the river as soon as the battle commenced. “Ten warriors were killed on the ground, and three women and four children were taken prisoner; one Indian made his escape down the river. Levi Arnold was mortally wounded and Wiley Swilley slightly. The wounded men with the Indians captured and the stolen goods in the Indian’s possession (identified as being taken from Roanoke) were all brought to my father’s house. The wounded remained with us until able to get home. The goods were sold and proceeds of sale divided among the company. “The women and children were placed under a guard and were started for Thomasville. One night the mother of the children made a cup of tea and asked permission to step out, which was granted. As was the custom, the guard after waiting a few minutes, went out to see after them. Failing to find them he made a thorough search but the three women had made their escape in the dark. Returning to the house they found the children all dead having been poisoned by the mother. 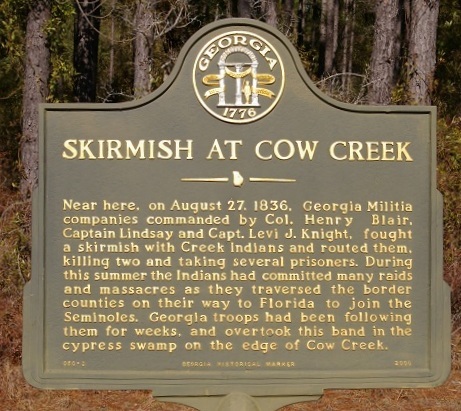 A more immediate and local prelude to the Brushy Creek battle was the Skirmish at William Parker’s place on the Alapaha River, where Levi J. Knight’s company of militia fought with Indians on July 13, 1836. Knight’s company then marched toward Brushy Creek to join with militia companies there under the leadership of Major Michael Young (Thomas County), Capt. James A. Newman (Thomas County), Capt. John Pike (Lowndes County), Capt. Hamilton Sharpe (Lowndes County), and Capt. Henry Crawford Tucker. By the time Knight’s Company arrived at Brushy Creek, the fighting there had concluded and the burial of the dead (Pennywell Folsom) was in progress. 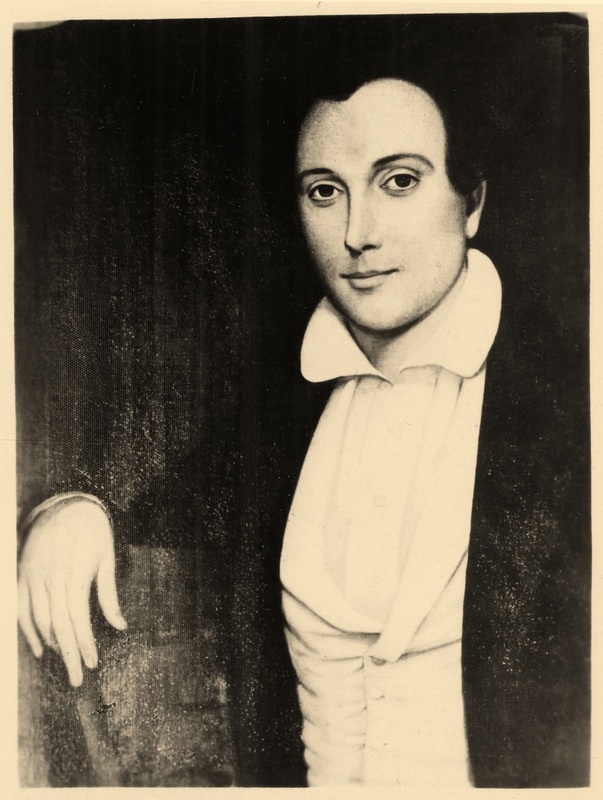 Levi J. Knight’s official letter informing Governor Schley about the Skirmish at William Parker’s place was transcribed in a previous post; Levi J. Knight Reports Indian Fight of July 13, 1836. The official report of the Battle of Brushy Creek was written by Col. Thomas E. Blackshear in a letter (transcribed below) to Governor William Schley on July 19, 1836, just days after the engagement was fought. Col. Thomas E. Blackshear’s letter to Governor Schley reporting the Battle of Brushy Creek. The following is a copy of a letter received by the Governor, on the 24th instant. “I have to inform your Excellency that on the night of the 11th inst., authentic information reached Thomasville that a party of Indians about fifteen in number were seen in the upperpart of Thomas County marching in the direction of Florida. By seven o’clock A. M. the next day, a company of men, forty-six in number, under the command of captain James A. Newman, was dispatched in pursuit of them. On Thursday thereafter, this company was joined by a company of about forty men from Lowndes County under the command of captain [John] Pike, when the companies elected Michael Young to take command of the battalion. “Scouting parties being dispatched, the Indians, fifteen in number, were discovered in the fork of the Big Warrior creek and Little River. The Battalion immediately proceeded across the River and scoured a very thick, muddy swamp about two miles wide and three long without making any discovery. A company of thirty-one men from Thomas County under the command of Captain Luckee and of thirty-one men, from Lowndes, commanded by Captain [Hamilton W] Sharpe then joined the battalion. The next morning Captain Sharpe was sent up the east side of the river to ascertain whether or not the Indians had crossed the river and left the swamp. Having found their trail he dispatched a messenger to the Battalion and proceeded to follow after the Indians. After pursuing them about three miles he came up with them, about sixty warriors and their families, a battle ensued in which he lost one killed (Mr. P. Folsom) and one wounded when he was forced to retreat.